Sony Xperia Z1 a.k.a Honami has appeared in numerous leaks and we even saw a press image of the upcoming cameraphone from Sony. Now, the high-res versions of the official press renders of the Xperia Z1 have been leaked ahead of its announcement at IFA, Berlin. The high-resolution images show us the elegant design of the Sony Xperia Z1 along with the power button, volume rockers, dedicated camera button and the microSD card slot on the sides of the smartphone. Sony's upcoming flagship smartphone is rumored to sport a 5-inch Full HD display and a 2.2 GHz Qualcomm Snapdragon 800 processor, 2 GB of RAM, 20.7 megapixel camera and Android 4.2 Jelly Bean. 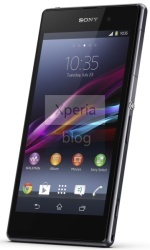 Sony Xperia Z1 will be officially unveiled on September 4 at the company's IFA event. Do remember to check back with us as we will be bringing you all the latest news, hands-on images and videos from the trade-show. Open your eyes mate, this phone is far from elegant.